Glass toughening & lamination technology has improved the strength and toughness of glazing products. This has given rise to a whole host of new uses for glass. Walk on glass floors are one such product & can significantly enhance the brightness inside your home. 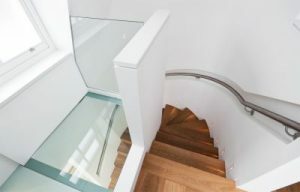 The toughened laminated Walk on glass floor is inserted into the floor to allow natural light to permeate through your home. Walk On Glass Floor can brighten up even the darkest of homes and has a high visual impact. 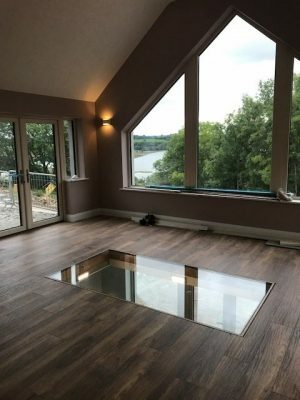 A glass Floor Turns your home into a fantastic contemporary living space! Allow Natural light to flow through your home with the clever use of Our glass floor panels. A Walk on Glass floor will allow natural Light to permeate your home negating the need for electrical lighting during daylight hours. We at Glass Depot supply Walk on Glass Floor panels in stairwells, passageways, walkways & we deliver Glass throughout Ireland and the UK. You can also leave a Voicemail any time of Day or Night with your phone number and email address and we will get back to you as soon as possible. To make sure we provide outstanding service, one of our Expert Specialists will be assigned to project manage your job from start to finish …Keeping You informed and making sure your specifications are met down to the smallest detail. Sligo Glass has a management control system called WorkFlowmax incorporating quality assurance and which tracks each jobs performance and delivery. The Job Order / Contract ensures your Job is managed as in a timely & efficient manner. WorkFlowmax monitors job productivity to ensure the best possible price and on-schedule delivery. Key Quality Review Point checks and sign-off ensure QA.